The main aim of this article is to show you how to execute MySQL Stored Procedures in Python. To accomplish this, I have prepared a simple python example which executes the MySQL Stored Procedures. Before moving further, make sure you have the following in place. MySQL stored procedure name which you want to call. 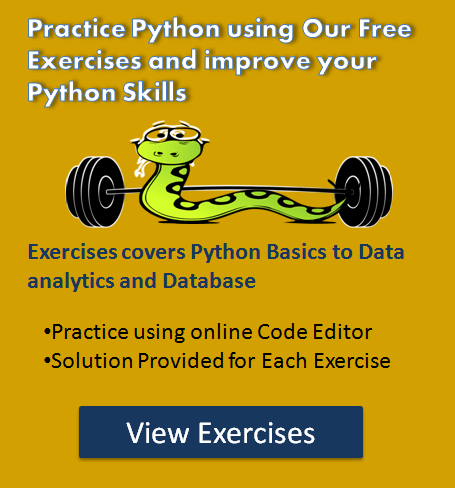 For this lesson, I have created a stored procedure “fetch_users” under “python_db” database. This procedure fetches user details based on the user id passed as an IN parameter of the stored procedure. If you already know the stored procedure that you want to execute from then, you can skip the following query. Open MySQL console and run below query to create a MySQL Stored Procedure. Now you know the stored procedure to execute so let’s move to our example now. Note: We are using MySQL Connector Python module to execute MySQL Stored Procedure. Create a MySQL database Connection. Create the Cursor object using the connection object. Execute the stored procedure, using the function cursor.callproc()(here you must know the stored procedure name and its IN and OUT parameters). Use cursor.stored_results() to get query results. Close the cursor object and MySQL database connection. Let see the example now. In this example, we are going to execute the “fetch_users” stored procedure using python. The import mysql.connector line imports MySQL Connector Python module in your program so you can use this modules API to connect MySQL. 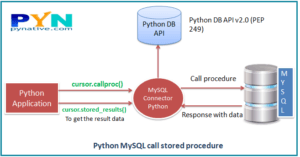 We are using mysql.connector and Error objects of the MySQL Connector/Python package which is used to show us an error when we failed to execute a stored procedure. Example ER_ACCESS_DENIED_ERROR when username or password is wrong. We used the function mysql.connector.connect() to connect the MySQL Database. We used a connection.cursor function to get cursor object from the connection. this method creates a new MySQLCursor object, Using this object we can stored procedure. Then we called the stored procedure “fetch_users” using the function cursor.callproc('fetch_users',[1,]) here we passed a stored procedure name, and it’s IN parameter value. In the end, we are closed cursor object and database connection. If you want to master the database programming techniques in Python You should check out our Python Database Programming Exercise once. cursor.callproc() method calls the stored procedure mentioned in the proc_name argument. The args sequence of parameters must contain one entry for each argument that the procedure expects. For example, the procedure can have one or many IN and OUT parameters. cursor.callproc() returns a modified copy of the input sequence. This method doesn’t change the input parameters. However, Output and input/output parameters may be replaced with new values as per the execution result. The stored procedure returns output in result sets, and It is automatically fetched and stored as MySQLCursorBuffered instances. For example, a stored procedure “addition” takes two parameters, adds the values, and returns the sum. 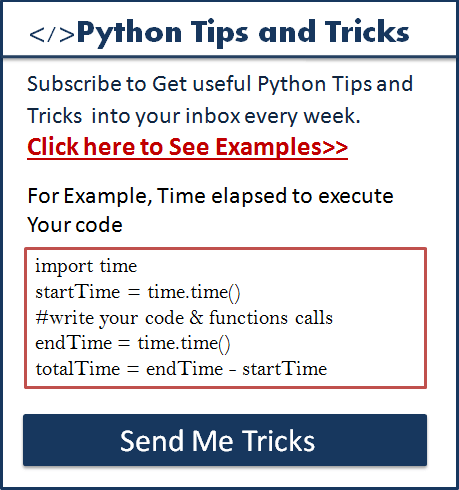 The following example shows how to execute this Add procedure in python. What is the line 3,4,7 supposed to represent? Please don’t post erroneous material like this..
Hey Steven. Thank you for comment. We apologizes if issue in this particular code. Give us sometime to check, we will definitely correct if required. Hey Steven example is correct. Tuple entry was by mistake we removed it. We already mentioned steps and code in First example. In second example to called “add” stored procedure, here we just provided the snippet you should write it in correct code format by referring the above first example. Let me know if you still facing problems.